Almo Nature - Dog - HFC 70 Alternative is tasty dog food that is based on delicious Italian recipes. This food contains 100% HFC ingredients which originate from sources suitable for human consumption. This way, you can be sure you are feeding your dog the best dog food. This food is packed with delicious, fresh meat that your dog will certainly find irresistible. Almo Nature - Dog - HFC 70 Alternative is delicious wet food for your faithful four-legged friend. 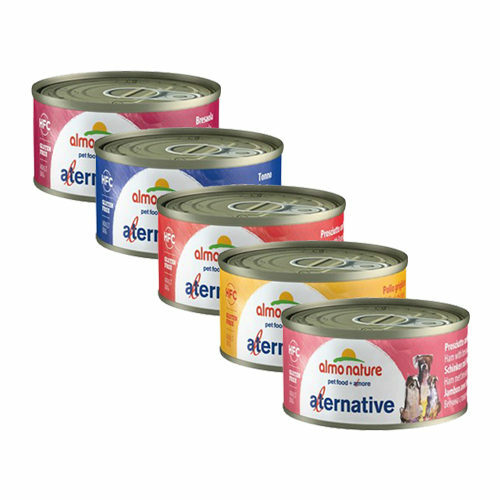 This dog food is available in a variety of flavours which are based on delicious Italian recipes. You can be sure that you are feeding your dog the best dog food, as it is prepared with 100% HFC ingredients. These ingredients originate from sources suitable for human consumption. Tuna: tuna (55%), fish stock (42%), rice. Ham and Parmesan Cheese: ham (51%), cheese (Parmesan, 4%), rice. Ham and Bresaola: ham (50%), bresaola (5%), rice. Grilled Chicken: grilled chicken (55%), rice. Have you used Almo Nature - Dog - HFC 70 Alternative before? Let us know what you think about this product.